So when I start typing things on Facebook... bad things happen. This time it turns out I get myself embroiled in a duel... with a couple of the guys at my local FLGS... one of whom is an accomplished tournament painter (his entry into this year's crystal brush) more of his work can be found here. The other participant is also a talented painter who maintains a blog like mine here. I should really not be allowed on the internet, it clearly gets me into a lot of trouble! 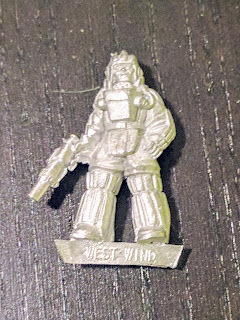 This is a promotional figure that was made by West Wind miniatures for their Secrets of the Third Reich preorder (I think). 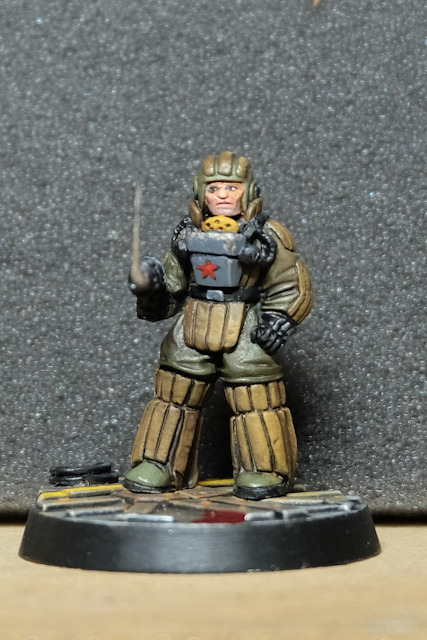 He is a Soviet Mech Pilot by the name of Konstantin Samokhin and it really isn't the most impressive of sculpts. It was actually hard to track down images of this figure as I think most folks just haven't bothered with it. I only found two painted examples (1, 2) and neither wowed me (although both painters have talent). The figure is very bulky, intentionally so I think given it is clearly protective padding, but the surfaces created and the theme don't give a lot to work with. My temptation was to do extensive sculpting but that really didn't seem to fit with the spirit of the duel. 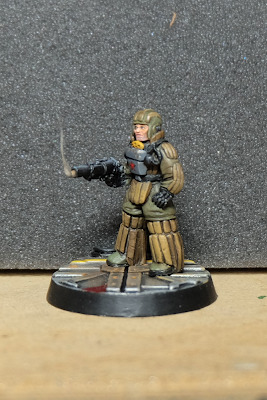 In the end I opted for a slightly showy base (a spare I had after getting some Sector Imperialis bases for my Space Hulk Terminators) and a more 'true to life' figure. I did slightly manipulate the figure to bring that gun up. 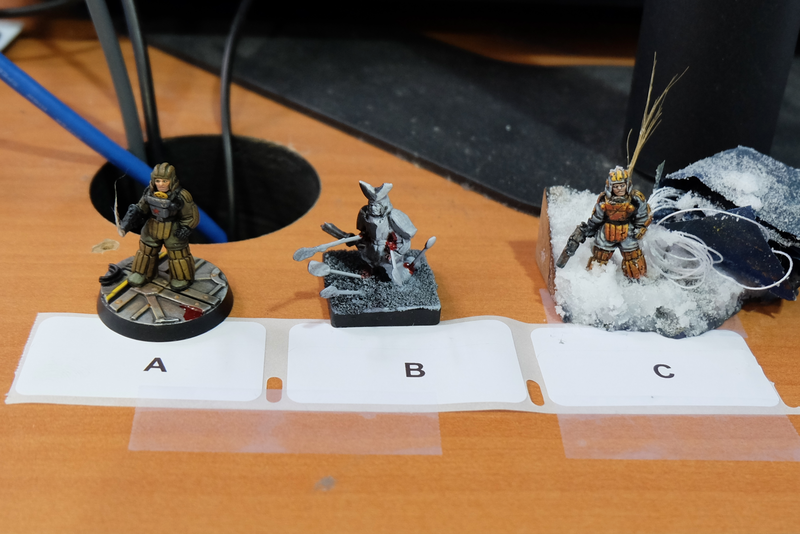 I felt the original position looked artificial - clearly done to make casting easier. I wanted something a little more dynamic. This new pose just required a little snip to split the arm from the body and then gentle plier application to get it up to a shooting position. The pose is still not super realistic but I think it has a bit of Sean Connery era Bond to it 'shooting from the hip' kind of spy work. For me the lack of detail on this guy was the opportunity to put some real effort into the figure to make it shine. Having recently done so much work on faces, I decided that should be the focus. I zenithal primed with an extra blast to get the face highlighted up and then really worked on the skin tones to bring up a little 3 o'clock shadow and blood to the lips. The painfully obvious temptation based on the sculpting of this model is the ubiquitous rebel pilot a la Star Wars. I couldn't do this, it was a little too obvious. I agonized over the painting of the clothing for the longest time (see above photos of a painted face and detailed base with untouched clothing as evidence). 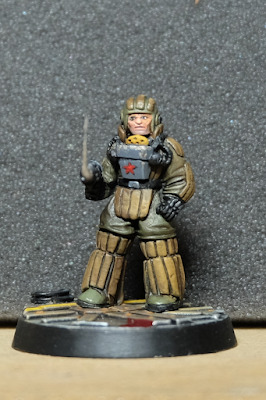 In the end I decided to stick to the original intention of the model - Russian Mecha pilot. I looked at the few examples of this figure having been painted (see above) as well as examples of Russian Fighter Pilots, Cosmonauts and Tank crews to give me a sense of the colors used. I am still working with a very limited set of paints (about 20-30 total) and so ended up mixing all of these colors from scratch - low on repeatability but for a one shot I like what I came out with. The drab green shifted shade quite a bit before I was happy with it. This has inspired me to write a piece on building up a paint set with a small budget/space which will be coming soon. 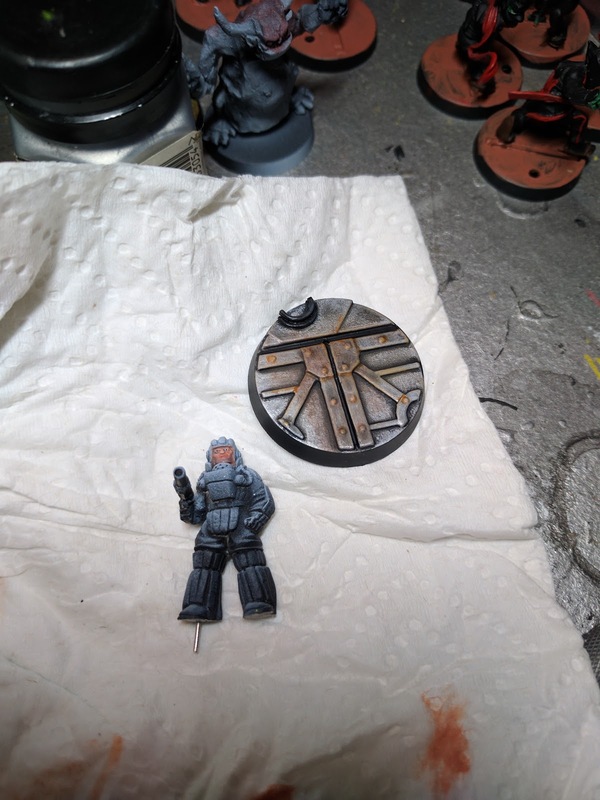 I was trying to get a chipped effect for the chest box with a freehand star... this is probably the worst executed bit of the model. I still need to work on chipping effects and although I think I am somewhat decent at freehand in general - this was of centered and really highlights my incompetence when it comes to planning freehands and why 'winging it' is not the way to go. As mentioned earlier I wanted the model to be accented by the base rather than over powered by it. The model itself is in serious need of accenting so I opted to step up the base from the round lipped 25mm base included. 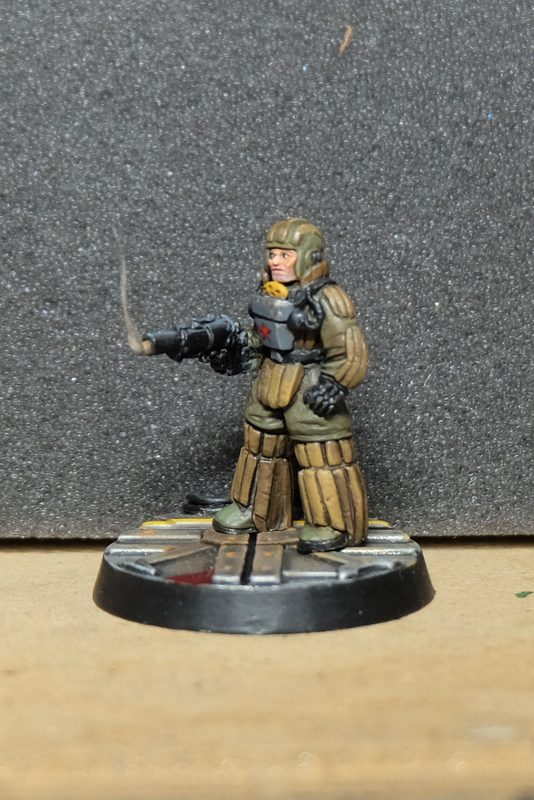 This more industrial basing seemed to have enough interest with little effort from me. I painted it up quickly and think it was a pretty decent job. Some paper clips for a little coiled wire at the back, rusting and then (not well pictured) I added some yellow edging to highlight a floor panel that opens with part of предупреждение (Russian for Warning... or so Google Translate claims) painted above it. I also opened up a new pot of Blood for the Blood God to have a little spill over from the unfortunate victim of my figure. So hopefully you already have some sense of the narrative I was trying to create for this model but in my mind: A spy has managed to take out a Soviet Mech Pilot and is trying to use his uniform as a means to secure entry into the base, however while still in the Mech hangar, he's been found out by someone and had to silence them... how much further can he get in this guise? I am not sure the narrative is really shouted from the roof tops and this is something I would love to learn from Carlos who has a way of really composing his miniatures in a fantastic way to tell these stories. In the end I placed second behind C painted up by store manager Seth. 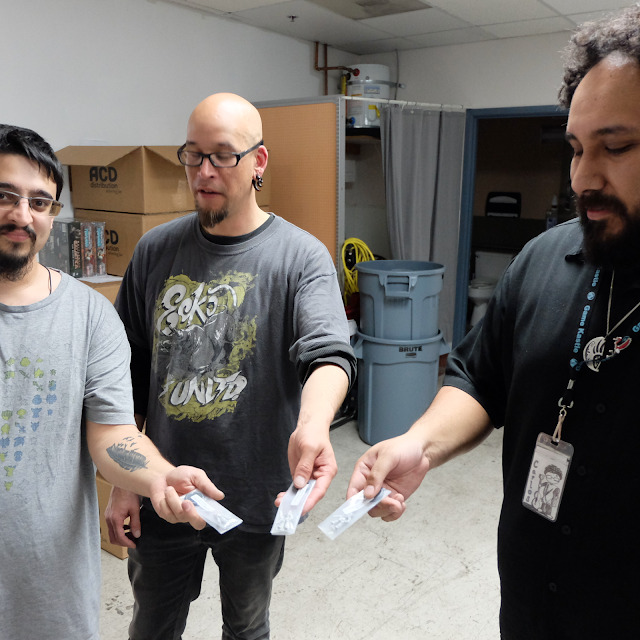 It was a great experience and seems like it has inspired the formation of a stronger painting community at the store which will be great, more details on that coming in the coming couple of weeks if you are interested.